The European Union, Norway and Switzerland received nearly 66,000 asylum applications from unaccompanied minor migrants in 2016, a decline of nearly 40% from 2015’s record total but still well above the total of prior years, according to a new Pew Research Center analysis of data from Eurostat, the EU’s statistical agency. 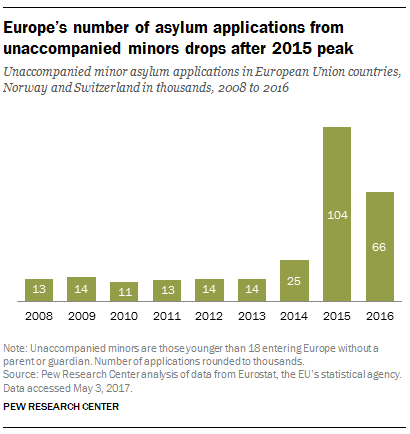 From 2008 to 2016, the EU, Norway and Switzerland received some 274,000 total asylum applications from unaccompanied minors, or those younger than 18 applying without a parent or guardian. (Data are not available before 2008.) The annual number of unaccompanied minor applications remained relatively flat from 2008 to 2013 before nearly doubling to 25,000 in 2014. During the refugee surge in 2015, European countries received more than 104,000 applications from unaccompanied minors seeking asylum. Counting all age groups, the EU, Norway and Switzerland received more than 4.8 million first-time asylum applications from 2008 to 2016, with unaccompanied minors representing almost 6% of the total. The asylum application data in this analysis do not represent the total number of refugees who move to Europe in a given year. Applications may not equal the number of applicants because some people may apply in multiple countries. Some asylum seekers also may arrive in a year prior to when they file their application. In addition, many are not successfully granted refugee status and are not allowed to remain in Europe. As in previous years, most unaccompanied minors who sought asylum in Europe in 2016 were older teenage males. In 2016, three-fifths of the applications by unaccompanied minors (62%) were from males ages 16 or 17, substantially higher than the 53% of the applications for the combined years of 2008 through 2015. Eurostat reports the age of unaccompanied minors as determined by the country receiving the application, not necessarily what is reported by the applicant. Some officials have said some of these teenagers may actually be adults claiming to be a younger age to qualify for benefits for unaccompanied minors. In Sweden, the government has introduced biological tests such as dental exams to determine the age of those applying for asylum as unaccompanied minors. In 2016, Afghanistan was the most common origin country for unaccompanied minors seeking asylum in the EU, Norway and Switzerland, with about 24,000 applications. The other top origins were Syria (about 12,000), Iraq (more than 4,000), Eritrea (between 3,000 and 4,000) and Somalia (about 3,000). From 2008 to 2016, Afghanistan accounted for more than 100,000 European asylum applications from unaccompanied minors, making it the single largest country of origin. Germany received the most applications for asylum from unaccompanied minors in 2016, with nearly 36,000 (55% of all such applications received by the EU, Norway and Switzerland). Italy was second with more than 6,000. The top receiving countries of unaccompanied minor asylum applications have changed over the years. Sweden, for example, accounted for about 3% of European unaccompanied minor applications in 2016, down from 34% in 2015. Meanwhile, the United Kingdom received just 5% of unaccompanied minor applications in 2016, down from 32% in 2008. Statistics on the success rates of asylum applications by unaccompanied minors are not available from Eurostat. But among all asylum seekers to Europe, some of the highest success rates in 2016 were among Syrians, Afghans and Iraqis. By contrast, asylum seekers from the non-EU countries of Albania, Serbia and Kosovo have considerably lower success rates. In response to concerns about child migrants, the EU Commission recently encouraged member states to seek stronger protections for child migrants, particularly for unaccompanied minors.